To start sending and receiving faxes, simply sign up by completing an easy to complete online form. A number iwll be issued to you, and you may start using that number right away! Can I use this service in another country? Unfortunately, the free fax service is only available in South Africa. Can someone call from another country? 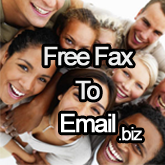 Unfortunately, the free fax service might not be accessible from all countries. A list of dialling codes and more information about calling from different countries may be found on this page.